Posted byMarjolijn	 November 15, 2011 April 10, 2012 Leave a comment on CERF fieldwork trip: Manatee! After a week of CERF-ing (Conference of the Coastal & Estuarine Research Federation) in Daytona Beach, Florida, USA, I was totally saturated with new knowledge. So a great time to go out to the field & spend a day searching for Florida seagrasses near Sebastian Inlet. Lori, our guide never saw the seagrass in such turbid & low biomass conditions and even when snorkeling in knee deep water we couldn’t see the seagrass or bottom. 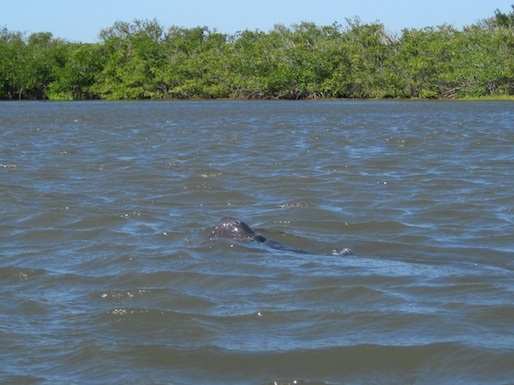 BUT I did saw my first manatee in the wild, they came very close to us (± 2m). A cool way to end a conference!